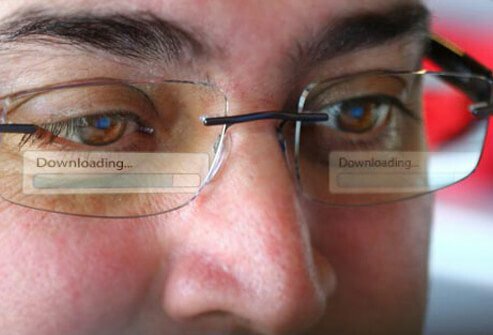 Screen time can be a key factor in choosing eyewear today, with 70% of daily computer users reporting eye strain. Computer glasses may ease the blur. Manufacturers say they help your eyes adapt to electronic words and images, typically viewed farther away than a book. 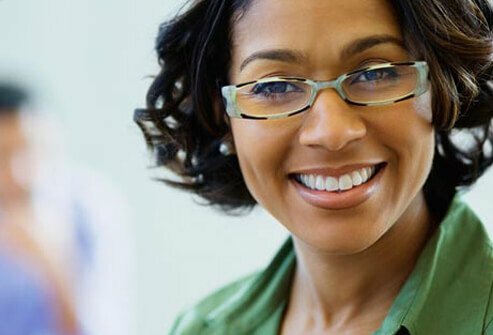 Look for anti-reflective coating and consider a tint to reduce glare from harsh overhead lighting. Fine print seems to shrink as we age. What really happens is presbyopia -- the eye loses its ability to change focus. 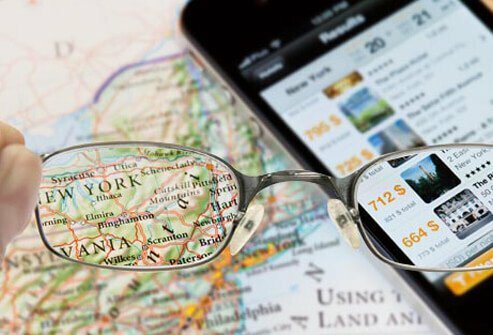 Reading glasses can help bring blurry print into sharp focus. You can buy "readers" at many stores. But if you need different strengths for each eye, require bifocals, or have an oddly-shaped eye -- called astigmatism -- see an eye care professional. If it seems like more people wear glasses at younger ages, you're right. Myopia, blurry distance vision, has been on the rise since the '70s. Farsightedness, or hyperopia, is less common. Both require corrective lenses. It's a myth that getting glasses will make your eyes weak. 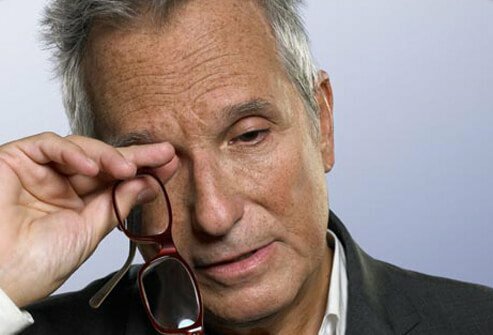 People may need stronger vision correction as they age. But that happens whether or not you wear glasses. Do you avoid a new prescription for fear of thick glasses and a "bug-eye" look? 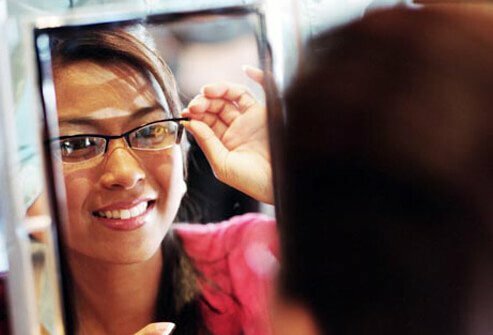 Ask your eye care provider about high-index lenses, which are thinner and lighter than traditional lenses. 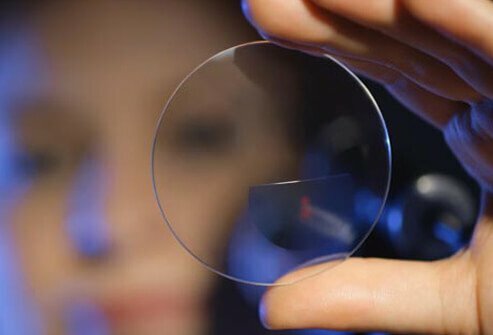 You also may consider aspheric lenses, which are thinned out on the sides. Lenses can be both aspheric and high index. Both can help you avoid a thick, unflattering shape. Do you need different glasses to watch TV and to read? 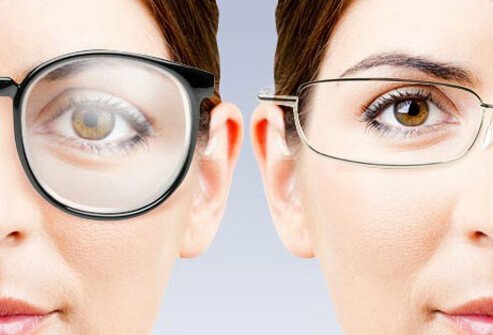 You may be a candidate for multifocal lenses. Bifocals have an area at the bottom for reading. The rest is for distance. Trifocals add a middle zone for vision 18 to 24 inches away, handy for computers. 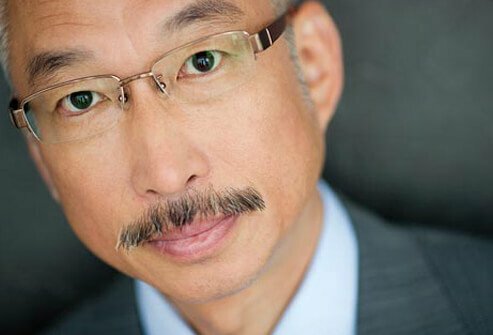 Progressive lenses, or "no-line bifocals," offer a gradual shift in strength -- invisible to your younger co-workers. 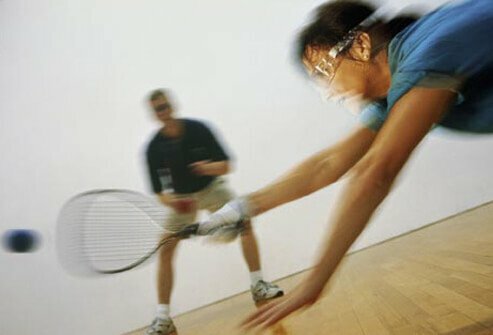 A racquetball travels between 100 and 150 mph. Imagine the force of that ball hitting you in the eye! Your best protection is sports frames with polycarbonate plastic lenses. They're 10 times stronger than other materials and polycarbonate material has the benefit of built-in UV protection as well. Sports with the most eye injuries include all racket sports, baseball/softball, ice hockey, basketball, and lacrosse. Protective eyewear could prevent 90% of sports-related eye injuries so it is strongly recommended. If you're wearing sunglasses for sports, consider colored lenses that may enhance vision for your particular sport. Yellow lenses may help in low light or haze to provide a sharper image. They're popular with skiers and snowboarders, cyclists, and indoor athletes like basketball players and racquetball players. Green lenses may heighten contrast while still keeping the balance of colors. They're popular for golf and baseball. Golfers say the green lenses make the ball stand out on the green (simulated in our picture). It's not yet clear that one lens color has the edge over another, so try before you buy. Many stores have samples to try with simulated light to see what color might work for you. 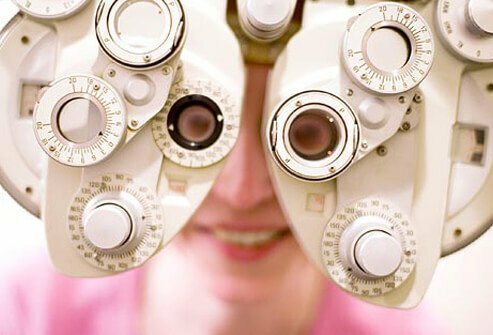 Getting the newest lens technology starts with an eye test. You should have an exam at least every two years -- to be sure your glasses are the right prescription and to look for medical issues. An exam can find cataracts and glaucoma, as well as illnesses like diabetes, heart disease, aneurysms, HIV, and cancer. Signs of disease may be visible in, on, or around the eyes long before symptoms appear. Little cobwebs or specks that move in your vision may be harmless floaters. But it's best to see a doctor with any concerns. Start with practical considerations when choosing eyewear. If you tend to crush things in your purse, remember that metal frames bend (and can be repaired), but plastics break. You should never leave glasses in a hot car, but could it happen to you? Plastic frames warp and can't be fixed. Metal frames just get really hot. 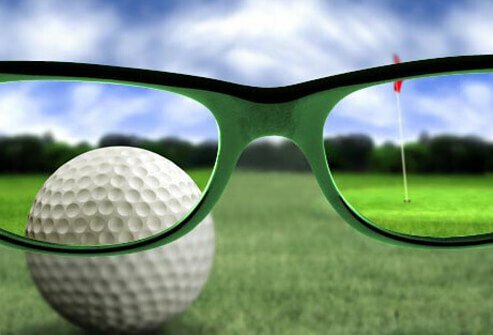 If you don't like glasses or need peripheral vision for sports, contacts are a great alternative. Smaller frames hide a strong prescription. Contrast flatters the face shape. For example, squarish frames on a round face. Strong, dark frames draw attention away from features you don't like (a chubby chin). Cat's-eye frames that point up at the corners can give the appearance of a mini facelift. Color can blend with your hair and eyes, or contrast for a bigger statement. If you work in a traditional field, think about titanium, stainless steel, or rimless frames for a professional look. For men, consider frames in brown, black, silver, or gunmetal. They're conservative colors and easy to match with professional clothes. For women, consider black, brown, silver, burgundy, and golden tones for the same reason. Tortoise-shell tones also are a classic. Show off your creative fashion sense with interesting metal or plastic frames in unusual colors and unique designs. Look for geometric shapes, contemporary larger frames, multi-color laminates, prints (animal and flower), or lasered details. Retro and vintage styling -- ranging from cat's-eyes to aviators to mod fashions -- also are back in style. If you want your personality to shine, look for trendy frame materials. You can find frames in wood, bone, and even buffalo horn. Show flair with gold (yes, real gold) frames or frames decked out in crystals or semi-precious or precious stones. Some frames are leather or wrapped in velvet. You may even find frames adorned in feathers, for an airy statement of your personal style. Harmful ultraviolet (UV) rays can pass through clouds, so sunglasses are a must -- sunny and cloudy day alike. Sand, snow, water, and your car's windshield all reflect extra light and call for eye protection. Look for sunglasses with 99% or 100% UVA and UVB blocking. 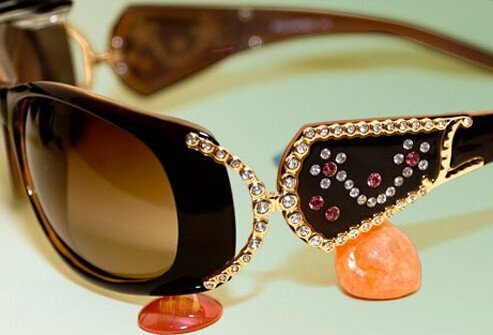 As an added benefit, sunglasses help protect the tender skin around your eyes and may help prevent cataracts. Bonus fact: driving exposes you to a lot of UV too, so consider a clear UV film for your car‘s side windows (front shields all have good protection). 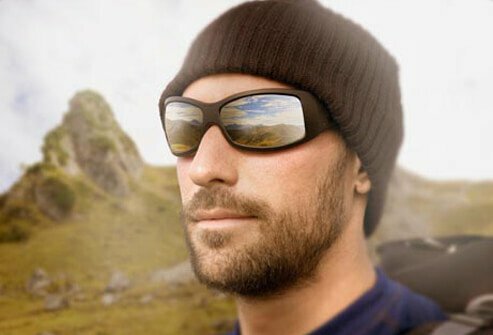 Sunglasses with polarized lenses are popular with people who spend time on the water or in the snow because they cut glare from reflected surfaces. And they've been adopted by many others who like a glare-free view. 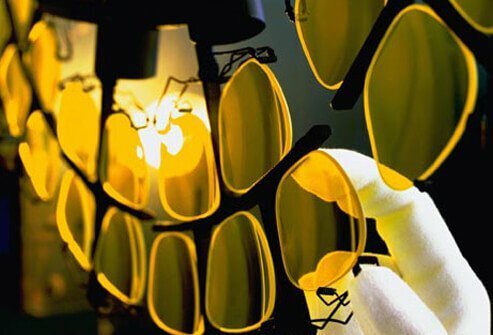 Anti-reflective coatings fight glare, too. 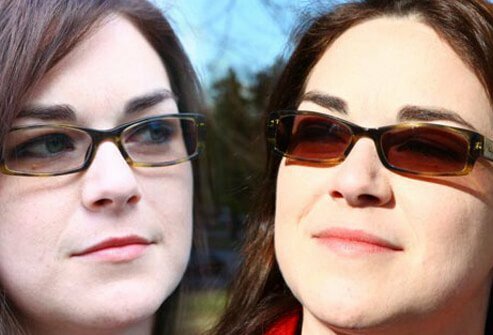 Mirror-coated lenses have a purpose beyond their style: They limit light coming into the eye, great for very bright conditions. Blue blockers usually have amber-colored lenses. They block blue light, which has been linked to eye damage. Because they also heighten contrast, they're popular with hunters, pilots, boaters, and skiers. Blue light also suppresses melatonin, the sleep hormone. At least one study showed that people who wore blue blockers in the morning slept better at night. When you need glasses but don't want to also buy prescription sunglasses, photochromic lenses are an option. They're clear indoors and darken automatically in bright sunlight. 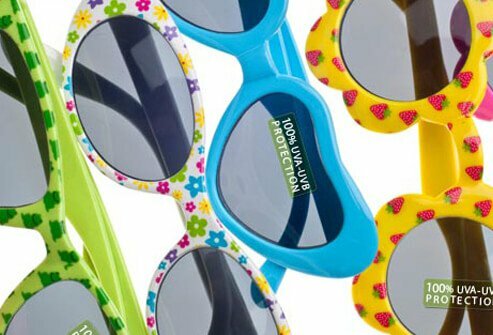 They block 100% of harmful UV rays and are handy for kids, who play outdoors a lot. One downside: They don't darken in a car; most windshields filter out the UV rays that trigger the color change. How Does the Sun Damage Your Eyes? 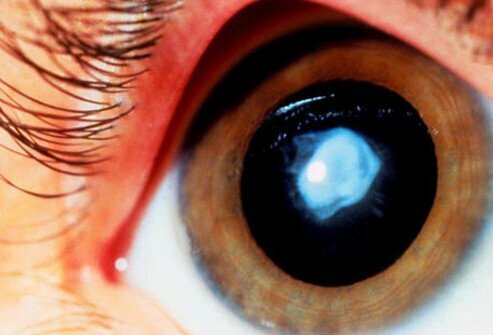 As we age, the odds of developing cataracts -- cloudiness of the eye's lens -- increase. Wearing sunglasses may delay cataracts. 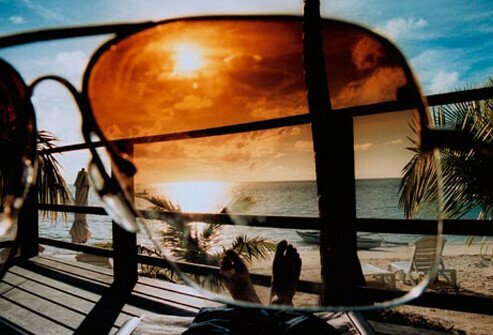 Sunglasses also may protect against macular degeneration (a disease of aging that harms central vision) and growths on the eye, both benign and cancerous. After cataract surgery, polarized glasses -- even indoors -- may reduce discomfort from glare. 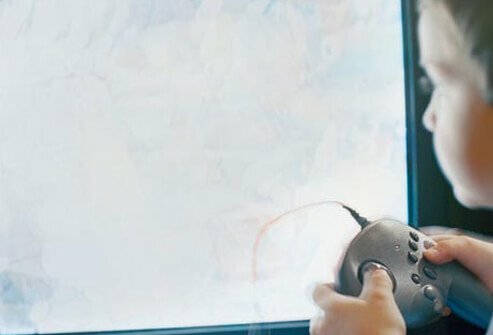 Do your kids have their noses glued to the computer or video game system? Get them outside. Some studies show that children who spend a lot of time on the computer or doing other up-close work, even reading, have a higher rate of myopia than other kids. And kids who spend a lot of time outside have lower rates of myopia. Pediatricians recommend no more than two hours a day of screen time for kids. Research shows 2,000 people each year have eye-related injuries on the job. 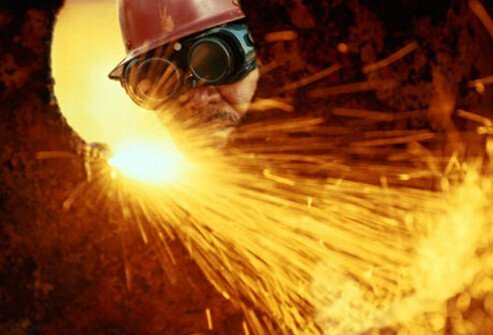 About 90% of them might been prevented by wearing eye protection. Eye injuries are caused by chemicals, foreign objects in the eye, steam burns, radiation exposure, and contagious diseases. 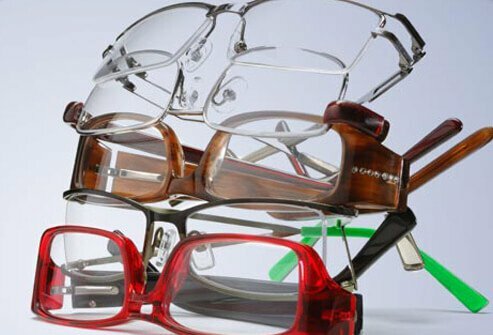 Nonprescription safety eyewear offers good protection. It must have nonremovable lenses and be permanently marked with "Z87." When swimming, snorkeling, or scuba diving with beautiful undersea creatures, using prescription glasses or contact lenses can be tricky. One option: goggles or scuba masks custom-made for your vision. 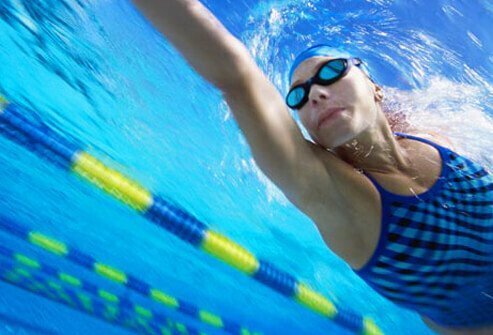 You may need a slightly different prescription for underwater use, because goggles can sit a little closer to your eyes than regular lenses, and a mask sits further away. All About Vision: "Aspheric Lenses for Better Vision and Appearance," "Bifocals and Trifocals: Solutions for 'Short Arms,' " "Choosing Eyeglasses That Suit Your Personality and Lifestyle," "Computer Glasses: Relieving Computer Eye Strain," Computer Vision Syndrome and Computer Glasses FAQ, "Eyeglass Frame Materials," "High Index Lenses are Thin and Light," "Polarized Lenses," "Reading Glasses," "Scuba Diving Masks and Swim Goggles," "Sunglasses: Frequently Asked Questions," "Ten Warning Signs of Age-Related Eye Problems," "Your Guide to Sports Sunglass Lens Tints." 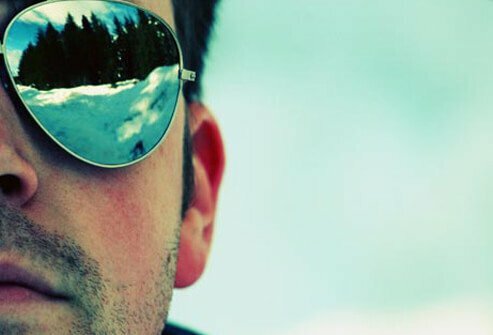 American Academy of Ophthalmology: "Sunglasses: Protection from UV Damage." American Academy of Pediatrics, Pediatrics, February 2001. 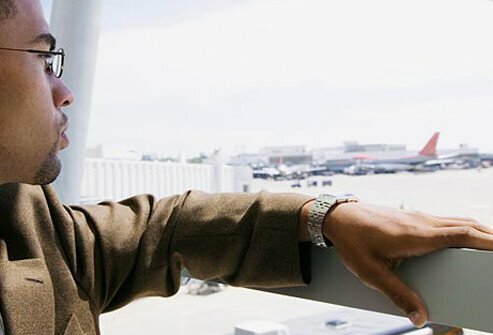 American Optometric Association: "Healthy Vision on the Job Is Everyone's Business," "Keep an Eye on Harmful UV Rays," "Protecting Your Eyes at Work." Andrea Thau, optometrist, spokesperson for the American Optometric Association; associate clinical professor, SUNY College Optometry. Bryant, Gaye, LDO, ABOC, NCLEC, Eye Consultants of Atlanta. Davis, F. Championship Racquetball, Human Kinetics, 2011. David O. Meldrum, LDO, Eye Consultants of Atlanta. About Cataract," "Facts About Floaters," "Myopia on the Rise in the U.S. Population." Rose, K. Ophthalmology, August 2008. Sasseville, A. Chronobiology International, July 2009. Seang-Mei, S. Investigative Ophthalmology & Visual Science, February 2002. TASCO: "The New ANSI Z87.1-2003 Standard." University of Illinois at Chicago: "Presbyopia, Why Bifocals?" University of Illinois Eye & Ear Infirmary: "Vision Myths." West, K. Journal of Applied Physiology, March 2011. Wolffshon, J. Optometry and Vision Science, February 2000.